If you own a 2015-2017 Shelby GT350 and are looking for a complete, catless exhaust system, then this Kooks exhaust kit is the perfect solution. Manufactured from T304 stainless steel tubing, each piece of this kit is engineered to be a direct replacement for your factory GT350 exhaust. This system features stepped headers, cross-over pipes without catalytic converters, X-Pipe, and Kooks' tried-and-true 3" oval race mufflers. The stepped headers in this system define the art of "scavenging". These headers start out a 1 3/4" diameter and then widen to 1 7/8" for optimum horsepower and torque. The end of the headers feature a 3" exhaust flange which bolts directly to the included off-road mid-pipe. 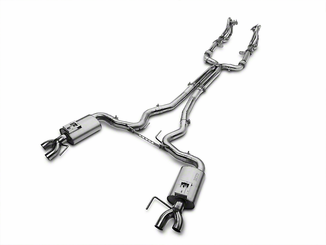 This exhaust system features a catless midsection between the headers and X-Pipe. This off-road piping is made from the same high quality, T304 stainless steel mandrel bent materials to ensure great exhaust flow for increased power and torque. The Kooks Competition X-pipe features the same T304, mandrel bent stainless tubing and connects to the very popular, 3" oval race mufflers. 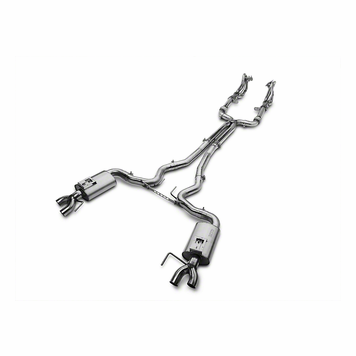 This muffler design helps achieve a very distinct, aggressive exhaust tone. The mufflers then exit to the quad tips that are 2.5" in diameter and will perfectly fill the factory tips located on the rear valance.